In 2012, history was made at Citizens Bank Park in Philadelphia. Yes, Ryan Howard hit his 300th home run, Jimmy Rollins collected his 2,000th base hit and Jim Thome hit a memorable walk-off bomb. Yet the history we’re talking about has nothing to do with the action on the field and everything to do with … beer. You see, 2012 was the first year when beer locations changed in Citizens Bank Park. On a really hot summer day, this food/drink blogger and Phillies phan used to walk out to left field just to purchase Sly Fox Royal Weisse on draft (as first recommended by Philadelphia Inquirer food writer Craig Laban). When I noticed a change in location last April, I thought others must be looking around for their favorite brews, too, right? After that “deep thought” and many hours walking around the stadium, the “Good Brews at Citizens Bank Park” spreadsheet was born. [See last year’s original post here.] Whether people referenced it as a guide, locator or list, the Phillies phaithful greatly enjoyed our hard work last year. So we’re back, walking, sipping and chronicling the 100, 200 and 300 level concourses at the ole’ ballpark in 2013. As they say, history repeats itself, and it appears beer locations at ballparks are no exception to the rule. 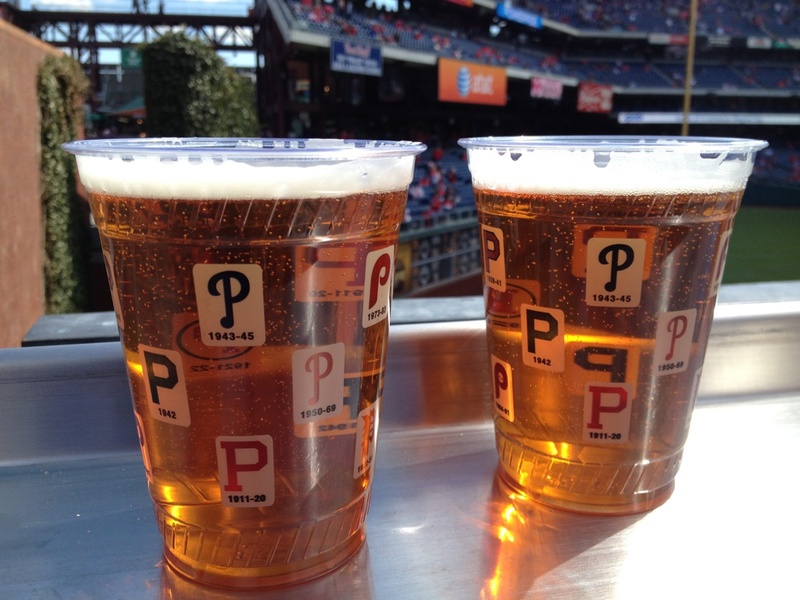 In 2013, CBP beers have changed locations … again. Have no fear, you can still find them with a little assistance from your good friends at Chocolate Covered Memories. Yes, indeed, we walked the entire ballpark (again! ), recorded what’s on draft, bottle and can in every location (well, we recorded the good stuff, that is) and created the ultimate spreadsheet for beer-loving Phillies phans’ viewing (er, drinking) pleasure. As you may have heard, the former-Irish Pub in right field Section 102 is now called the Alley Brewing Co. It features 18 (yes, EIGHTEEN!) taps. A ton of craft beer bottles and cans are available here, as is Victory’s new Alley Brewing Co. Lager, a crisp light brew. There’s also a really cool Phillies plastic cup offered when you order a super premium pour (during exhibition games, those were two different Goose Island brews from Chicago), which we didn’t see offered anywhere else. On draft, Victory Summer Love has replaced Victory Hop Devil almost everywhere in CBP, which is nice for those hot months, although we love Hop Devil in the cooler weather. This season, bottles of Victory Hop Devil and Victory Headwaters Pale Ale can be found almost everywhere, not just at Brewerytown locations. Flying Fish Red Fish has joined Flying Fish Farmhouse Summer Ale and Extra Pale Ale predominantly throughout the park. There are some awesome offerings from Allagash, Dogfish Head, Ommegang, Philadelphia Brewing Company, Sly Fox and Troegs, just to name a few. Gluten-free and healthy food options are much more accessible throughout the park, as are new, gluten-free Angry Orchard Hard Cider cans, in addition to last year’s Redbridge bottles and Woodchuck Cider on draft. Sly Fox Pikeland Pils is a nice addition to the regular can selection, joining standards such as Corona, Guinness, Sierra Nevada, Stella and Yuengling. There are a lot more craft beers in the 200 and 300 levels now, which is great for all beer lovers! There are now three full-service bars with booze and wine (and one with frozen drinks!) that you can access with a regular ticket. And, lastly, if you’re a domestic beer drinker, then you might as well have some fun with it … There’s a poured-from-the-bottom-of-the-cup station near home plate; Miller High Life & PBR are at one location; and there are 24-ounce domestic mega-cans scattered throughout the park (while supplies last; those jawns were super popular last year). Want to know where to find all of these new brews for your next “I’m-gonna-grab-a-beer-during-this-pitching-change” moments in 2013? 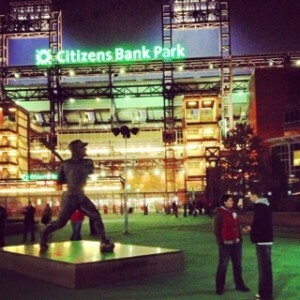 Without further adieu, here is the second annual Chocolate Covered Memories Good Brews at Citizens Bank Park Spreadsheet (2013-style). Get Thirsty! Enjoy! Cheers! And, of course … Go Phillies! This is great for Philly. Soooo many local beers!!!! Hopefully Yards is included in that list??!! Thanks! Indeed, Yards Brawler is in 109 & 132. Yards Pale Ale is in 323. Yards bottles in many locations, too. Cheers! I love the beer selection at CBP. I was pretty disappointed with the beer garden, though. There were 4 lines, and one wasn’t moving because the bartender was bringing sample after sample to 3 idiots. As far as the 18 taps, there were a lot of duplicates (including 3 Shocktops, 3 Long Trail IPAs, and a couple of Goose Island duplicates.) There may have been 9 different beers actually available on tap. Among the cans and bottles available, thank goodness Bud, Bud Light, and Bud Light Lime are available at the beer garden! I’d rather just walk around and see what’s available at the stands. Also, Yards’ Philly Pale Ale is just a couple parts per million away from being gluten free, so you may still be okay with this. What about smithwicks? My husband liked having that there last year but could only find it at one place in the hall of fame club. Would section 100 be able to go up to the hall of fame for it? Craft beers are great but I’d also like to see done that aren’t pale ales! I so r want all light beers. Thanks! Making my way into HOF manana. Will let you know. Alas, you can’t enter HOF without a HOF ticket, and I haven’t seen Smithwick’s anywhere else in 2013. Good news: try a Flying Fish Red Fish – it’s a red ale with a hoppier kick – plus it’s local from South Jersey! Available on draft in 114 & 141 and available in bottles in many locations. Hope your hubby likes it! Cheers! I liked the Stella drafts at the Irish Pub. They now have vendors in the seats selling Stella cans which is nice. The new Alley spot lost Stella drafts. Do you know anywhere in the park to get a Stella draft? Sorry. I haven’t seen any Stella on draft yet this year. If I see or hear of any, I’ll let you know. If you want a little variety from the Stella can, maybe go with a Heinekein draft by Sec 120? I love the Victory Prima Pils in RF Bullpen Brewerytown (next to Campos). Go Phillies! Cheers! Update/Good News For You: Stella was on draft at the 112 Goose Island kiosk last night. I updated it on the beer spreadsheet. Cheers! Go Phils! Thanks so much for all the awesome shoutouts, y’all! Thanks, My seats are in 103 so a short walk to 112 will work. Great job. I have your spread sheet from last year bookmarked on my phone.